Earlier today I wrote about the Gem rebrand and Gem.com deal. I think domain name financing options are underutilized. Perhaps it is because they are lesser known than other types of financing, but I think prospective buyers and sellers need to consider and/or offer financing options for domain names to get deals done. In mid-February, I noticed that Marksmen, a brand protection and intellectual property acquisition company, had acquired the Poosh.com domain name. A couple of weeks later on March 2nd, Poosh.com transferred to a third party. I noticed these two Whois changes when the domain name showed up in two of my DomainTools morning alert emails. Everyone knows that privacy is important. Maintaining privacy in this day and age is nearly impossible, though. 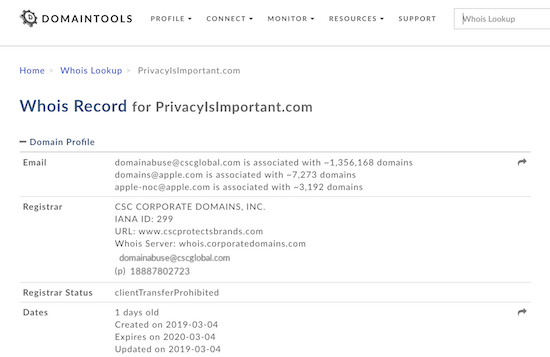 Privacy breaches have become a common occurrence at companies of all sizes over the last several years, including a major iCloud incident at Apple. In addition to the accidental privacy breaches, large companies seem eager to monetize the private details of its customers – and pretty much everyone it can! It’s not a secret that I like one word .com domain names. I am almost always on the hunt for a good one word .com domain name, although they are often difficult to buy. Although I am still in a bearish mood right now, I am still buying domain names. I regularly participate in domain name auctions and I send inquiries and offers daily. The majority of the acquisitions I am making right now are two and three word .com domain names (I only invest in .com domain names), and they are mostly in the 3 figure range.